I have always liked to decorate my files and folders with pictures. 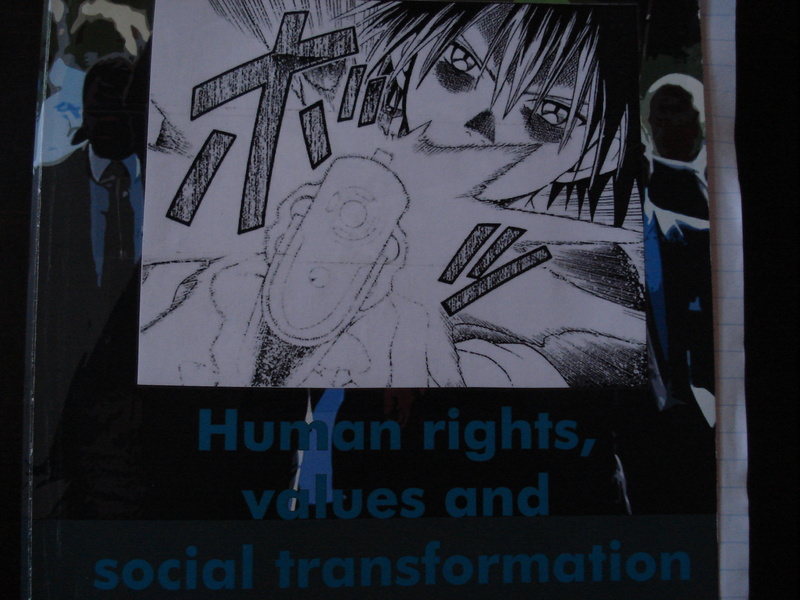 Recently I’ve taken to putting pictures on my study guides, usually they are pictures from FFVII or Naruto. This year it turns out that all the pictures I printed were from Black Cat, mainly because I’ve been rereading it these last few days and it is really cool. I started out planning which pictures went where. 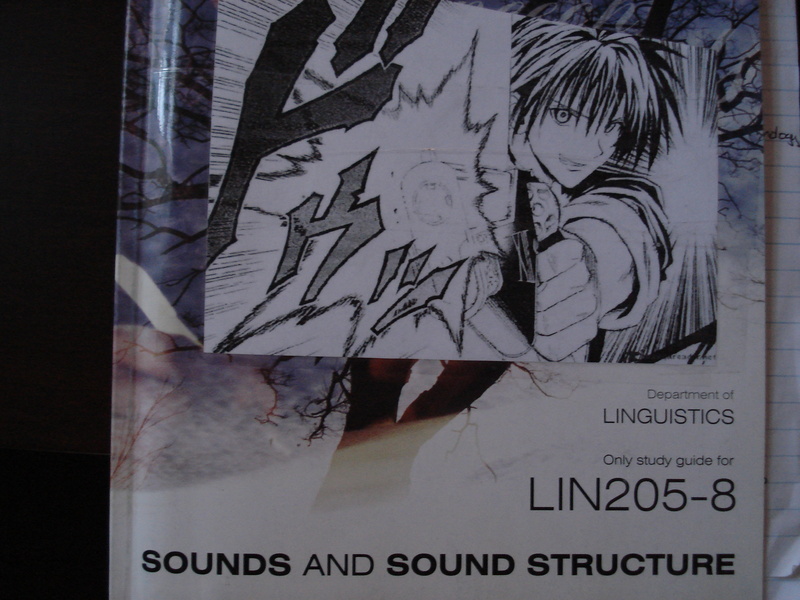 Sounds and sound structure got a frame with a SFX down the side. 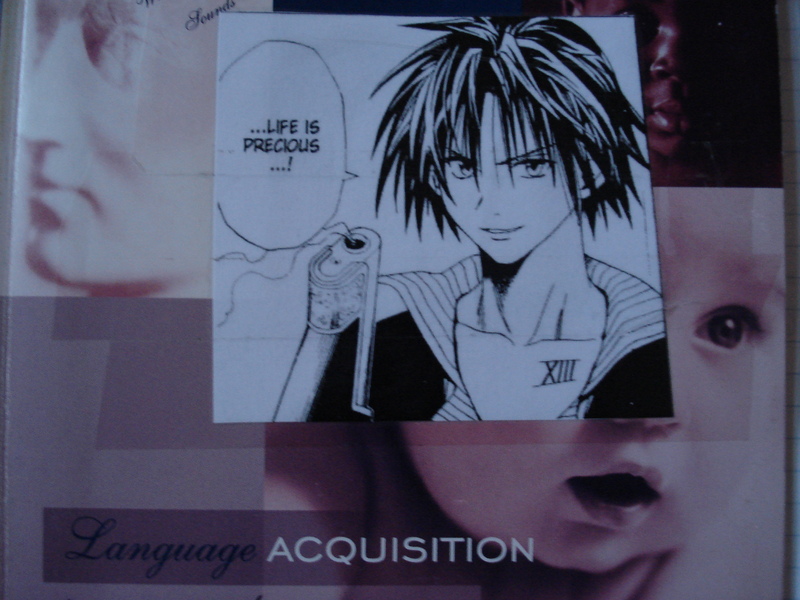 I ended up putting the ‘Life is precious’ on the Language Acquisition. It’s funny for me because Train is saving a dinosaur lol~ After two I just starting putting pictures on the nearest book. Then I noticed what I had selected for Human Rights. It reminded me of Clarkson and his ‘shoot ’em in the face’ comments. When working in an office environment, it is inevitable that the subject of weight will come up. I’ve managed to side step it for almost seven weeks but it crept up yesterday and persisted till today. All random encounters now deal with Weight Watchers. My sanity is saved by the occasional chapter of Black Cat but my curiosity got the better of me when handed the Weight Watcher’s booklet. Every thing is counted in tablespoons or grams, right down to the olives you eat and the sauces. And I’m not talking about say, a bolognaise sauce, I’m talking about piccalilli, chutney or mint jelly. Even seeds are counted. I swear, you loose weight through mental arithmetic and sheer laziness of counting. I actually went through the food list and found that coconut cream is has the highest number of 11.5 points per serving. In some area of measurement that makes it the winner, and so the one you must eat the most. Curries all round then 😛 Though I would prefer it in a rice pudding. Interestingly, double cream has 2 points compared with non-dairy topping which has 10.5 points. Not only does non-dairy topping sound awful but it costs you points. When people are getting something for free there is a tendency for them to assume they are allowed more than being offered. They also impose their preferences which is rather rude. When you are getting something for free, you say thank you, shut the hell up and do as the Gatekeeper says. It has been a while since I wrote about waiting for a manga chapter. This time round it’s Naruto. I am enjoying it so much right now – huge ninja war. It is fantastic. Bleach on the other hand seems to have gone adrift. As Aki-chan says it’s like bad fanfiction. There hasn’t been a new chapter for Blazer Drive for an age but there has been a few Break Blade. Attempting to work on an essay about human rights. It’s a bit annoying to find the energy for something I’m not all that interested in studying. The viola is bigger then the violin but we’re not talking hugely bigger, slightly bigger and no where near big enough to be confused with a guitar. But yesterday it was – twice. I foresee the religious slant of HRV1601 becoming an issue. I do not wish to ‘relate faith to normal activities … from the perspectives of human rights and Christian Ethic’. My cute little new phone had the battery life of… well, it didn’t really have much of a battery life. I was lucky if I got six or eight hours out of it and I had to charge it every night but suddenly, on Sunday, it decided to have a battery life and it’s reaching thirty six hours of life and counting. I’ve also noticed that the 3G symbol is gone. After doing some reading online, I’ve discovered that if the 3G is turned off, the battery life is lengthened. It’s good to know but I don’t know how it got turned off. Though I’m not bothered that’s it is off, I just don’t like it when appliances do their own thing. Mainly because if it can turn itself off, it can turn itself on and so I’ll be caught short with the battery dying on me. I forgot to bring some CDs with me to work so another quiet afternoon. The thing is, if it was quiet it wouldn’t be a bother but it’s not, there is the pool pump, the drone of the PC and the excited voice of high schoolers as they make their way home. I’m going to have to start looking for work again. Temporary work is running out end of March. It’s still the beginning of February but it’s already February and will soon be March. Weeks seem to go faster when I’m working, I don’t think I like it. Sometimes the barrier between two English speakers is English. X: Is there anything left? X: I need specific answers. Is there anything left? And I’m not even in Mossel Bay.